It is essential to have your garage door maintained regularly to keep it in good working order throughout the seasons. If your door is left over long periods of time without repairs, it will degrade and various parts can fail you when you need them to work most. 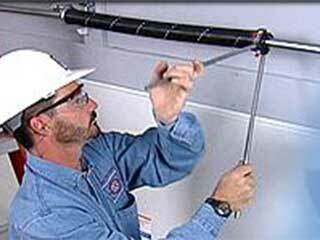 Our company has been offering expert repairs for years. We know how to keep all door designs in top condition and are prepared to replace any part that is broken or malfunctioning. Have a door that is moving too slow or fails to move at all? We can offer a thorough troubleshoot to identify the issue and then replace any components that are in bad shape. If your door makes too much noise, we can lubricate all essential mechanical features and ensure cables, springs and all screws are functioning properly. We can offer a range of openers to replace your current one if you are unhappy with its performance. Our technicians will make sure all upgrades are professionally installed, work perfectly and will explain all new functions to you before they leave. The most essential parts to keep in pristine shape on most garage doors are the springs and cables. Springs deal with great volumes of pressure and over time can become increasingly weakened. If they snap, the entire door will be useless. Changing a spring is one of the most dangerous tasks and should always be performed by an experienced professional. Contact our team today if your door needs expert attention. We can arrange call outs around your schedule and won't be happy until your door is working as good as new! Contact us now for more information or to make a booking!